The South Arkansas Valley Town Company was organized and incorporated in 1887 to do business from Dodge City, Kansas. It was chartered to buy and sell land in the Bloom and Kingsdown townsites of Ford County on the right of way of the Chicago, Rock Island and Pacific Railway. W. C. Shinn, President of the Directors, purchased 382 shares of company stock in the name of C. F. Jilson (trustee for the CRI&P). The company was disbanded and the final dividend paid in 1906. 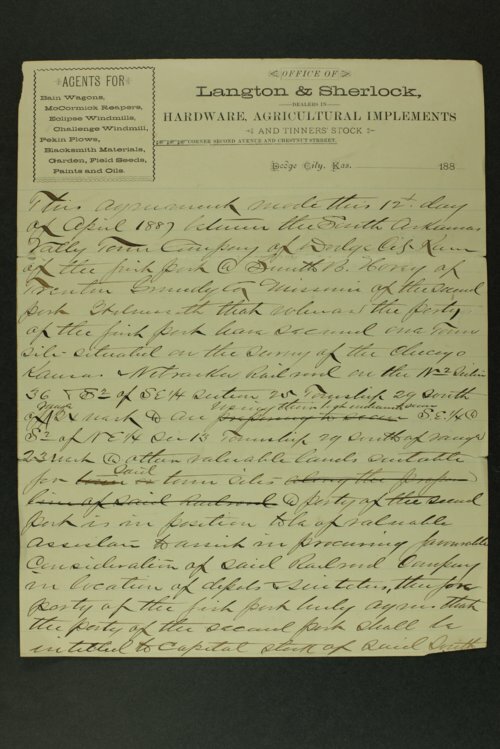 These records include correspondence, land contracts, financial statements, town lot price lists, and assorted ledgers.